The mixtape illustration for 2016's Lil Uzi Vert Vs. The World is the kind of image that you come back to. Interracial couples kiss amidst flashing cameras. Expectant eyes watch in awe or jealousy. Hands--brown, white, and taupe--are outstretched, ready to give away hard-earned cash. 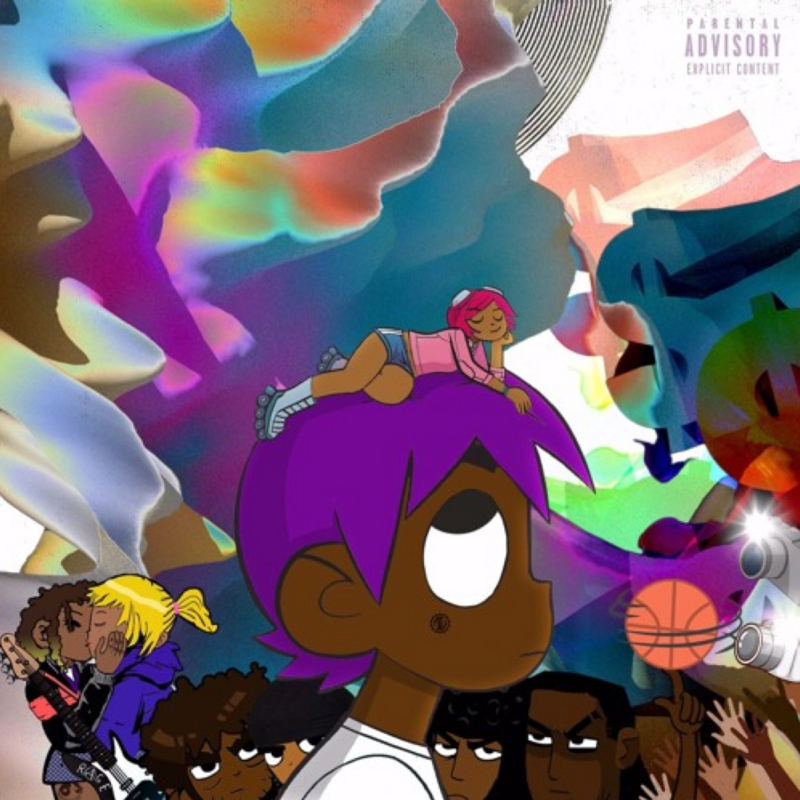 Uzi, the center of the image, towers over everyone. And there, perched on the top of his purple head like a crown, is Brittany Byrd. Under a particular lens, Byrd's placement on such an inescapable piece of art would be the subject of much discussion. It would be explicated, her likeness analyzed. Like many aspects of black life, music created by black bodies often goes unexamined by the mainstream. A critical lens is not applied to subjects perpetually rendered inapt. Pale women are able to inspire, influence, and inform sartorial choices, artworks, and beauty trends with careful detail and endless profit. They are able to be respectable muses, noted for their ability to inspire. They stand in contrast to black women, the world's most generous muse, who's stripped of her likeness and bleached with deceit. With nearly 200,000 Instagram followers, Byrd is changing all that and claiming her fame as the muse of one of music's biggest young names. Byrd's not just in Lil Uzi Vert's album art, but also appears as the centerpiece of his video " Money Longer," and frequently on his social media channels. And the Internet as a whole has embraced her as well. Fan pages are dedicated to her style and hair color, drunken partygoers recite "my brittany got mad" with the same affectation as her famous lover on "XO Tour Llif3." 22-year-old Byrd developed her unique style at a young age, and moved from her native Los Angeles to study at the elite Parsons School of Design in New York after a stint working as Lindsay Lohan's personal stylist. Over sushi in New York's East Village, we spoke about fashion, her relationship with Lil Uzi Vert, and her plans for the future. You're known for your style, which is incredibly distinct and avant-garde. What inspires some of your looks? The Harajuku vibe and Japanese culture inspires a lot of my looks. Gwen Stefani was a really big point of influence for me growing up. "Hollaback Girl" was my favorite song in the fifth grade and it stuck with me forever. I initially discovered what Harajuku was through the international kids at my school. The Harajuku vibe was created during the postwar Allied occupation of Japan, when American soldiers and civilians lived in the area. Curious Japanese youths came to experience a different culture and browse the Western goods in local stores catering to the Americans. I find that really cool because it's something that came naturally, out of curiosity. Seeing the Harajuku culture become mainstream inspired me even more. Ever since I can remember my style has been off-kilter; I started dying my hair in fifth grade. During middle school we had to wear uniforms, and I was always that girl finding ways around looking like everyone else. I grew up watching anime, Spirited Away, Sailor Moon, Naruto. I live for juxtaposition and playing with different price points, silhouettes, and textures. Is there a story behind the pink hair? It started with Hello Kitty. When I was younger there was a Momoberry store in the Beverly Center. Everything was pink but so expensive, so I would save my allowances for big purchases. I gave myself the goal of buying everything in the store, but that was so unrealistic. I bought a leather backpack, one that I still have and wear, and I always carried that association with me. When I met Uzi, that's when I decided to dye it. We both merged our anime influences and it's crazy because now we look like Team Rocket when he has his purple hair. I'm not interested in changing it anytime soon. That's what got me in with Japanese cultures and designers. Learning about Junya Watanabe and Rei Kawakubo, the way they deconstruct the notion of what clothing is and can be. So much of my wardrobe is made up of their pieces. I also really love Alexander McQueen. He didn't believe in fear in design; he turned runway into theater. Dover Street Market. Star Struck Vintage in the West Village always has gems. I always find a great designer piece or a sick tee. Totokaelo is great too, their interior design is incredible. How did you end up working with Lindsay Lohan? I was her stylist first and then became her personal assistant. I used to work at Art Partner and handled editorial portfolios for Mario Testino, Alasdair McLellan and Glen Luchford. I would study their images; they were their own worlds. The focus wasn't on the girl's identity, it was a work of art, all for the sake of commerce. There was something so beautiful about that to me, and it made me more interested in styling. I started working for Kode Magazine and the Editor-in- Chief, Allan Troy Watson, couldn't make it to style [Lohan] and asked me to go. That's when we just clicked. We ended up traveling all across the world. She was the first person I ever tried cryotherapy with in Monaco. You just graduated from Parson's School of Design, what's next? Infinity and beyond! I really want to create from an honest place. I don't have a desire to just make something for the sake of making it. That's never been something that motivates me. Everything has to be of quality, of emotion. Whether it's clothing, art pieces, or furniture, it has to be genuine. A few months ago I opened a design studio where I've been working on upcoming pieces for my furniture line, called BYRDLORE. And in 2016 I made an art book called Glitter Tears, composed mainly of behind-the-scenes photos. Dating a musician can sometimes lead to people neglecting your individual accomplishments. Many publications cite women involved with musicians as "the rapper's girlfriend" and never as an individual. What do you think of that? I get that a lot--or simply "Uzi's girl ." There's no comparison to the sun and the moon. That's the biggest misconception, the girlfriend label. My name is Brittany Byrd and I'm pretty rad. I'm many things and for him, I'm the coolest lover of all time. How did you and Uzi meet? It's actually quite regular, we met through a mutual friend, and just had an instant connection. What do you think attracted you to one another? Knowing we are both not of this planet; that was the main thing. I'm a very spiritual person and when we met one another, there was like this moment of recognition. Two aliens in America. What was it like going from behind the scenes to becoming a social media star? It was so exciting. I was balancing school and then traveling all over the state. The energy of all the crowds inspired me so much, especially getting to interact with them, and connecting. But I was always studying like crazy for finals and making sure all my assignments were submitted on time. You have 333, which seems to be a recurring motif for you, tatted on your hand. What does it mean? I would see it all the time my first year of college. Everywhere I went, I kept seeing that number. License plates, clocks. I started getting into numerology and put together all the pieces. I was born in March, my birthday is the 23rd. I did my research and learned that 33 is a master number. It confirms that you're on the path to ascension. Whenever I was in doubt, I would see it, and it keep me motivated. This random night in New York City, I decided to get it tatted. You're a muse to one of the biggest stars in the world. What inspires you? Right now, design. I'm inspired by Virgil Abloh and his overall artistic expression with clothes, furniture and couture. I'm inspired by Vener Panton's mid-century furniture design. His work creates a mood, a very groovy mood while being visions of the future. And of course, Uzi. He's my muse. His work ethic is unsurpassed.